GREENSBORO – It sounds almost too good to be true, and there does not seem to be a drawback, even in the fine print. A part-time job that offers an hourly rate higher than the federal minimum wage. Free community college tuition – and the student gets paid even as they sit in the college classroom. 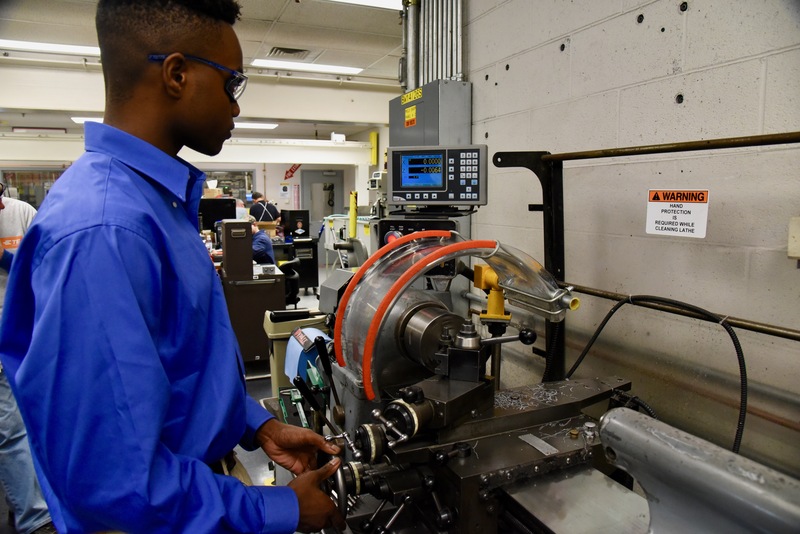 Andrew Hairston, a senior at Northern Guilford High School, works a lathe machine at TE Connectivity in Greensboro. He goes to school for half a day and works a shift in the mold shop the rest of the day. Within five years, Hairston has a chance to earn his journeyman’s card and an associate’s degree – all paid for by TE Connectivity. Upon successful completion of the program, each student has the inside track to a good-paying career. Students like Hairston have made the decision to apply for the Guilford Apprenticeship Partners, a program that provides eligible young women and men the opportunity an alternative to pursuing a traditional four-year degree. And since it does, on its surface, sound too good to be true, representatives of one company help provide the sense of urgency to indicate the program’s authenticity. Steve Cockburn is the manager of the mold shop at TE Connectivity, a company that creates connectors to harnesses in the automotive industry. Supervisors like Cockburn are looking down the road, five or 10 years from now, and what they see is empty work stations – with work piling up. That’s where students like Hairston come in. As a junior, he attended an open house for TE Connectivity with a parent. It was the first step on what could be a long and lucrative career path. “At one point, I had no idea what it was,” Hairston said. 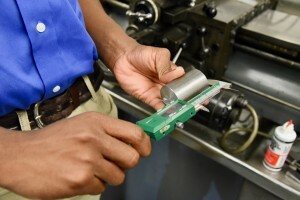 Precise measurements are important for Andrew Hairston, an apprentice at TE Connectivity. Here, he uses an electronic device to ensure accuracy within a certain degree of tolerance. After the open house, Hairston applied to the program. He was among the students who had earned a grade point average of at least 2.5 and had taken advanced math courses. Hairston had also shown reliability, having recorded five or fewer absences each year in school. After that, it was simply showing an interest, said Robin Sharp, HR business partner for TE Connectivity. “We invite those that qualify back to one of our locations,” Sharp explained. The students participate in four nights of orientation, including two nights of hands-on experience working on a project. Simply making it to the fourth night “helps us determine who we want to take to the next step,” Sharp said. Students who are invited to continue along in the process become part of a ceremony akin to an athlete signing a national letter of intent to play sports in college. It’s a big deal, Sharp said. The program is not for everybody. Even those who make it through the four-night orientation, or even the six-week summer program, find reasons to leave. Hairston was one of 100 people to attend the open house. Fifteen students were selected for the orientation and nine made it to the six-week summer program. Only four were invited to become an apprentice. For people like Leigh Smith, such opportunities for some students can be hard to come by. Smith said even the work required of students during the four nights of orientation are impressive. With a hard work, the effort will become much more than building a toy train. Hairston and other apprentices will complete 8,000 hours of training in a period of up to five years. At that point, a successful apprentice will have earned a journeyman’s card and an associate’s degree in machining technology. For Hairston, it seems to be the right choice. Students who are interested in learning more about the Guilford Apprenticeship Partners program are encouraged to contact their school’s career development coordinator.